“A generation of safe and healthy workers” is the key message for this year’s World Day Against Child Labor on June 12. In honor of this day, Winrock will be sharing stories that highlight some of our innovative solutions to combat child labor and provide youth with safe economic opportunities. This story is part of a series, so please stay tuned June 8 to June 15 as we share more successes from our projects around the world. Independence Day in Ghana is colorful and joyous, marked with parades, speeches and community celebrations. This year, young people in Ghana used the occasion to show off safety gear given to them by Winrock’s Mobilizing Community Action and Promoting Opportunities for Youth in Ghana’s Cocoa Growing Communities (MOCA) project, funded by the United States Department of Labor. 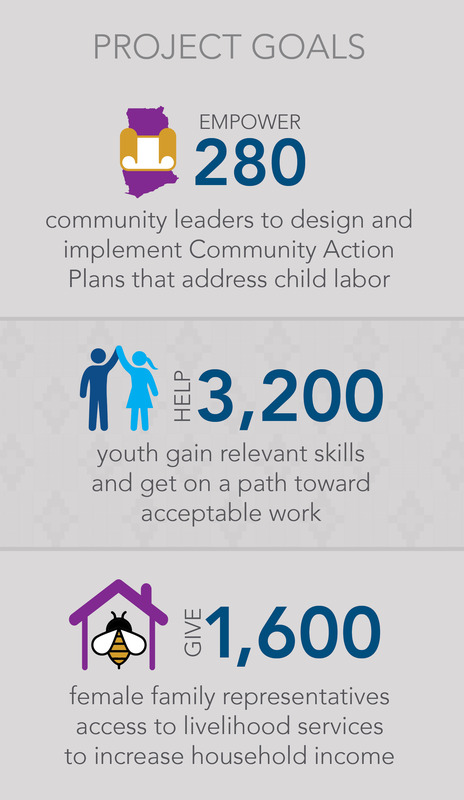 The MOCA project works with 15- to 17-year-olds, women, and households in 40 communities in the Western and Ashanti regions of Ghana to address the issue of hazardous labor. It does this by providing technical training through model farm schools and community-based vocational education and training. This includes occupational safety and health training complete with boots, gloves, overalls, goggles, face masks and hats. Youth are brought in to inform their peers, using poetry recitals and drama as tools to spread occupational safety and health training messages. During the recent Independence Day celebration, young people also spread these messages to the entire community, showing off the gear that protects workers from chemical spraying and other hazards. In an effort to transition youth out of hazardous labor and into safer rural economic opportunities, the MOCA project trains them to set up and manage cocoa seedling nurseries as a sustainable business. The income from the seedlings covers the costs of new seedlings, tools and materials, while also helping these teens further their education by attending senior high school. 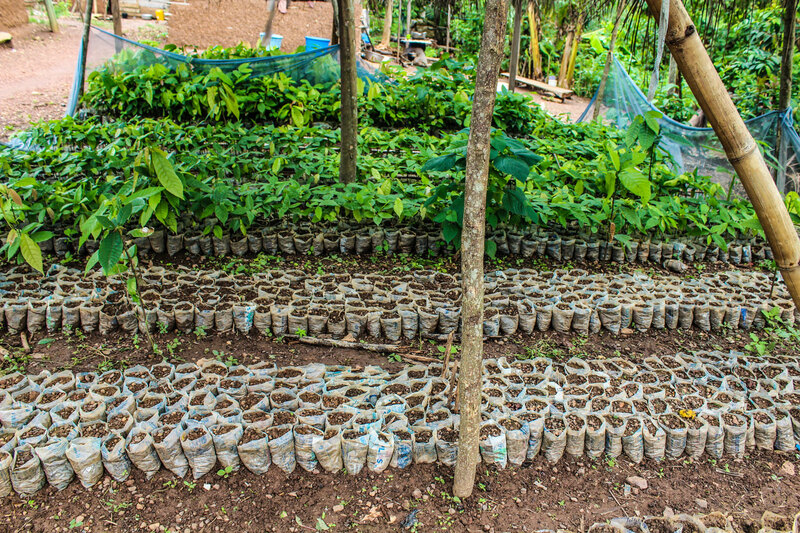 There are 16 cocoa seedling nurseries, each expected to produce approximately 10,000 seedlings to sell to local cocoa farmers. The 16 MOCA nurseries are expected to sell 160,000 seedlings to cover 400 acres. While MOCA is training youth to run nurseries, the Ghana Cocoa Board is supplying improved, high-yielding, disease-resistant cocoa seedling varieties to the nurseries. Farmers have already requested to be put on a waiting list to buy seedlings once they mature; 20,000 cocoa seedlings at two nurseries have already been pre-sold. Learning to manage cocoa seedling nurseries provides youth with employable skills and generates income for themselves and their households. With these new skills and a safe working environment, young people are excited about their future in the cocoa sector. Don’t miss our social media campaign in honor of World Day Against Child Labor from June 8 to June 12. Funding is provided by the United States Department of Labor under cooperative agreement number IL‐28095-15-75-K-5. This material does not necessarily reflect the views or policies of the United States Department of Labor, nor does mention of trade names, commercial products, or organizations imply endorsement by the United States Government. 100 percent of the total costs of the project or program is financed with Federal funds, for a total of $4.5million dollars.